Walden 3.0 | An Old School Game Dev Coding from a Lakeshore Cabin. I am going to start blogging at dougsharp.wordpress.com . I just uploaded a lot of my Clarion West blog entries about working on my novel, now called Hel’s Bet. I am starting to work on ChipWits again. I had 2 1,000 word days in a row. I am going to finish that novel by the end of July. Lots of nature news – our loons have chicks. I saw them riding on top of one of the parents. This is the first Summer I’ve seen them with chicks. Hope they make it through the Summer. A bear has stripped most of the blueberries off Ogre Island. It left mounds of its calling card all around the island to mark its territory. I’ve been eating a few berries every time I visit the island, but the bulk of them are ripped up and riding in some black bear’s tummy. I am slowly improving ChipWits. Having a bit of problem focusing to program because I’ve restarted a seizure med. Since I’ll be driving Margaret to Seattle and visiting friends there for 2 weeks in the middle of July I think it will be August before I hold the next contest and start the countdown to release. Slow, but I am determined. The game is looking really good, but it takes more time to accomplish programming tasks with wobbly neurons. The Clarion West Write-a-thon is going swell. I’ve hit my 500 word/day target every day since Sunday. I’m going to cross the 110k word line tomorrow for total Channel Zilch word count. I’ll let you name an astronaut or singularity hacker in the book if you win the auction. I’m proud (and a bit surprised) that it has a bid from someone I don’t know. A cheap way to have your name enshrined in high-class literature – bidding has started at $10. Time to work on ChipWits. It’s the second day of the Write-a-thon and I did another 500 words (529), which is my daily target. It’s great motivation to be writing in the company of the other 33 Write-a-thoners. Some of us post our progress on the Clarion West forum so there is a sense of comradery and shared purpose. It’s a hoot turning the clay heads of gangsters from my 22-year old game King of Chicago into pirates. Margaret made a sweet pirate outfit for him of which we’ll be taking some photos tomorrow. I also did some painted ships and captain cabin interiors. Last thing we did was to watch the final 3 episodes of Full Metal Alchemist, an excellent animated series. Great art, filled with non-clichéd dramatic situations and characters. Highly recommended. I’m sure I’ll watch all 51 episodes again. Off to swim in the lake and then I’ll do some ChipWits work. It was great fun teaching Margaret programming. I led her on a forced march through the Flex interface, gave a brutally quick over view of MXML (Adobe’s layout language), rushed through an intro to object-oriented programming, and finally gave a cursory glimpse at ActionScript. M is going to develop the combat code for GODinabox. She and Ian want to implement a fairly standard combat system for their American Dream GODclub. I have always wanted to teach Margaret programming. She is, after all, a third-generation computer game developer. Only recently have I been able to handle long, fun conversations. For 8 years a fun conversation automatically triggered a seizure. I got a little nerve-frazzled after about an hour of it, but took a rest and came back and gave a good final lesson, and talked through getting FightClub up and running. We’ll elaborate FightClub to let Margaret experiment with interesting combat coding. We worked hard that night cleaning the cabin. We had to get it ready because prospective buyers were seeing it at 10 and at 12 on Friday. We got it looking pretty good and got a short night of sleep. The next day we drove to Rice Lake. We did errands while the real estate agents showed The Pad. Got Margaret craft supplies for making creepy dolls. Had lunch at an off little coffee shop called A Big Pile of Yesterdays or some such – it’s mainly an antique store with a coffee shop in the back. She gave me an overview of the American Dream GODclub. Very cool. I’m not going to give any theoludical spoilers. It’s going to be fun and pretty straightforward to make the GODinabox code provide the game-play features American Dream needs. Later that night I decided to use the King of Chicago clay heads for the pirates in the Flying Spaghetti Monster GODclub. 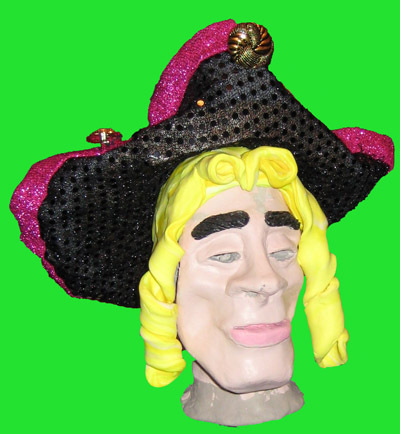 Margaret is going to make outrageous pirate costumes for them and we’ll stop-motion animate them. I think we may animate the FSM in real spaghetti. I plan to make the sets out of painted cardboard. I want to get back into doing visual art and this feels like a way that will work. Here’s the listing for The Pad. I’ve shown it to 2 people and tomorrow 2 others are taking a look. I’d say that’s a pretty good indication that it’s going to sell. Going to miss the place. I had a great day of programming yesterday. Got the Apollo file system working. I’ll be posting a Mac version of the game next week. I’d love to release ChipWits this month, but still am not able to schedule milestones reliably. The important thing is that I keep making progress. Today I get Margaret into ActionScript coding. Really looking forward to it. Had a gratifying nature adventure yesterday. A flycatcher has had a nest over our back door for the past couple of Summers. The nest came down because there were 6 fledglings weighing it down. I fixed it back with wire and a ceramic slotted bowl. As I type this I am watching the 2 parents busily ferrying bugs to their demanding brood. Got 150 words written last night. Did some research on ion thrusters. Had a great day of writing today. I’ve been doing a lot of prep work for the writing – summarizing the final chapters, transcribing voice notes, researching, plotting – and it paid off today when I wrote 500 keeper words in about 2 hours. Felt great. Tomorrow I start teaching Margaret ActionScript programming. She’s going to be handling parts of GODinabox – combat, special effects, and more – and we’re going to have fun getting her up to speed. I expect her to catch fire as a programmer. Spent a good couple hours on the lake today. Windy and warm. Saw my first pumpkinseed guarding a nest today and the first tiny fish from this Springs spawns. The lake is low and the lake bottom is pitted from beaver and muskrat burrowing for lily roots and last Winter’s attempts to dig new shore burrows in the shallow flats – the low water exposed every shore burrow last Fall. I am amazed at how “farmed” the lake is by its critters. Anyone want to own their own island, a simple cabin, and 11 acres of heaven? $160k. But it is a step toward being closer to my best friend. And that is an excellent thing. Didn’t sleep well so my brain wasn’t trustworthy for coding. I did get some good Channel Zilch work done. The storyline for the last chapters is jelling and I am thinking about the book a lot. Here’s my page for the Clarion West 2007 Write-a-thon. To finish Channel Zilch by the end of July I have to start writing now, and I’ve been writing regularly. I finished transcribing voice notes and got a ton of useful stuff. I spent tonight doing some new plotting, tightening up the back story and central motivation for the whole stealing-a-space-shuttle schtick. It’s coming together easier than I feared. I am reconfiguring a pretty big piece of the back story, so I wasn’t sure whether I’d have to cut 10k words or so. Turns out I’ll have to cut very little because of plot concerns. I’ll cut maybe 3k because the prose isn’t up to snuff. It’s been years since I did any original work on CZ so it feels great. I did a few paragraphs of new writing and I got right into it. When I write I tend to lose myself in my characters and what they’re up to at the moment. When I used to write at coffee shops in Seattle I’d sometimes find myself acting out exchanges of dialog, oblivious to the others around me. I love it when I’m acting out a bit and the character does something that completely floors me. Heloise – the scarey geek pinup who is the brains behind the Channel Zilch scam – often surprises me at the things she says when I’m acting out a bit of her dialog. We showed The Pad to the first prospective buyer yesterday. M and I worked ourselves hard and the place was looking good. The person who looked at it is a writer and a real outdoors person – a perfect prospect. The single thing that makes me saddest about selling The Pad is the cry of the loons at night. Sometimes they will serenade for a good hour between 2 and 3am. I’ll miss them.